Cardiff Devils will play the first game at their new home against Coventry Blaze on 27 February. 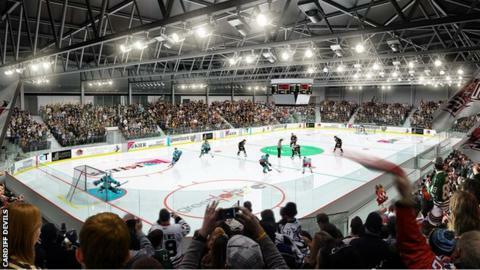 Ice Arena Wales will hold 3,088 for Devils home games, a big increase up from the 2,300 capacity at their current Cardiff Bay Ice Arena base. The Big Blue Tent has been a temporary home since 2006 following the demolition of the Wales National Ice Rink. "The facility is stunning," Devils managing director Todd Kelman said. "We are very pleased with it and I know our fans are going to love it. "There are a few things that still need to be completed, but it is nearly there." Devils are currently top of the Elite League and host Blaze in the league and Belfast Giants in the Challenge Cup in back-to-back home games this weekend.